The proposed plaza, park, and bridge hosts ceremonial and everyday events in a new mixed-use district for Ho Chi Minh City in Vietnam. Our project creates a kilometer long plaza, green in its physical presence, green in its construction and dynamically scalable to the events of the city. Floating above the entire plaza and bridge is a monumental pergola, a filigree of steel cables covered in flowering vines, the patterns of the openings creating an ever changing play of shadow and light. This unifying roof turns the plaza into a single super-scaled outdoor living room. At the same time, a panoply of differently scaled openings create a series of perceptual spaces of different sizes, intimate at the lake end and becoming progressively more grand as they approach the Saigon River. 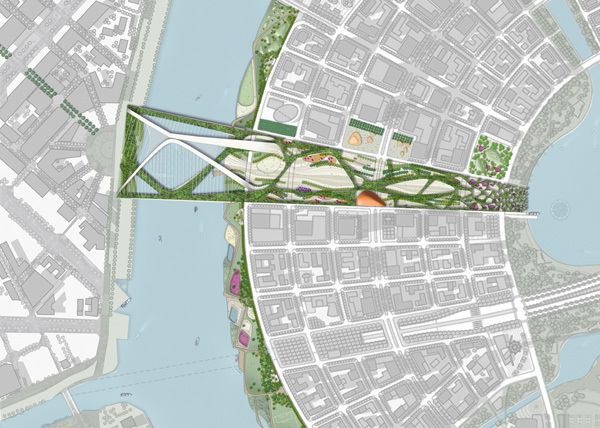 Comparison of Plaza Sizes:A network of paths and spaces defined by the landscape canopy extends over the river and creates the perception of a lengthened plaza that connects the two sections of the city. As well as providing shade for the plaza, the urban scale canopy defines a multitude of programmatic activities and scales to animate the space around the clock. 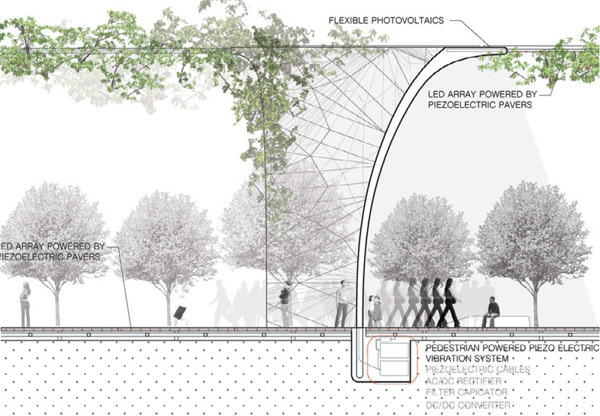 The canopy and paving work in conjunction as a new infrastructure: Both overhead photo-voltaics in the canopy and under-foot Piezo-electric flooring generates energy which then powers the lighting and public wi-fi installed in the canopy. Runoff water collected from the permeable paving is filtered and re-used for public restrooms and to drip irrigate the canopy vines.